After announcing 5x more union endorsements and raising 5x more than any other CA-10 challenger, Harder announces the sole endorsement of Democratic Women’s Club of Stanislaus County (Democratic Women’s Club). 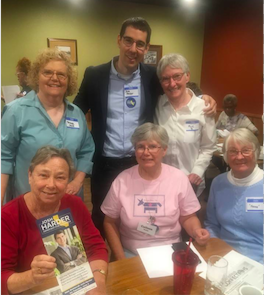 (April 29, 2018)—On Saturday, CA-10 Democratic Challenger Josh Harder (20 votes cast for Harder) earned the Democratic Women Club’s sole endorsement, over Michael Eggman (4 votes), Virginia Madueno (6 votes), and Sue Zwhalen (6 votes). This is just one aspect of Harder’s continued momentum—piling on the majority of union support in the district and raising over $350,000 in contributions during the 1st quarter-- raising a total of over $1,280,000. In the past week, Harder was officially endorsed by Iron Workers 118, making Harder’s labor support 5 times that of any other challenger. He has been endorsed by several local organizations and individuals such as the Stanislaus State Democratic Club, the Chair of the Stanislaus County Democratic Club, Teamsters Joint Council 7, IBEW 595 and 684, and the Bricklayers, Tilesetters, and Allied Craftworkers Local 3. Furthermore, Harder has secured the support of several prominent national groups including the New Dems, The Arena, J Street, and Council for a Livable World. In the past three months, Harder’s campaign also announced they contacted over 40,000 voters in the district at least once—a milestone no other candidate in the district can attest to. Harder is set to announce yet another labor endorsement in mid-May.